If you drive a car to and from work, from home to store or just around the city, chances are that sooner or later through no fault of your own, you will probably be involved in a motor vehicle collision. 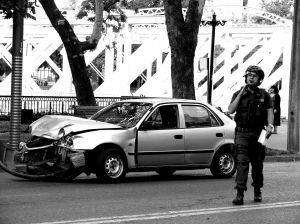 Oftentimes, the car accident is the result of a rear end collision. However, other car collisions are due to failure of one driver to yield to the other, failure to obey a traffic control device, improper backing, improper u-turn, improper lane change, failure to maintain lane, passing in a no passing zone and driving too fast for conditions, among others. These collisions can occur on Georgia’s public roads or occasionally on private property. If the crash occurs on private property, the police officer generally does not have the jurisdiction or authority to issue a citation to the at-fault driver. And, the police officer does not use the Georgia Uniform Motor Vehicle Accident report form for accidents that occur on private property. The steps listed below are in sequential order and in rank of importance. The steps are designed to ensure safety, record keeping, documentation and that you cover your bases while at the scene of a car accident in Georgia. It is best to review these steps, print them out and keep a copy in your car. Car collisions can occur at high speeds. The transfer of energy from the at-fault vehicle to your vehicle due to the strength of the impact has a direct effect on the movement of your body inside your car. Air bags are not designed to deploy in all collisions and the seat belt can only help so much. If you have not lost consciousness, then immediately check your physical condition and the condition of your passengers. If the car is on fire, turn off the ignition and exit the vehicle immediately. If the vehicle is able to be moved with safety, then move the vehicle as soon as possible from the roadway to the shoulder or other safe area. Use your cell phone or ask another person to call 911 and request the police. Be sure to ask for an ambulance if needed. When the police arrive, be courteous and professional to the officer and provide the officer with a detailed description of how the accident occurred. If you overhear the at-fault driver speaking to the police, be sure to take notes for use in evidence later. To the extent you can, avoid conversation with the at-fault motorist. Also, be sure to advise the police officer if you have sustained any injury or pain from the collision. There is a special box on the Georgia Uniform Motor Vehicle Accident report form for the officer to record this information. If you have a cell phone or camera inside your vehicle, take photographs of the scene of the collision and resting stop of the vehicles post-collision before the vehicles are moved. Further, please take photographs of the damage done to your vehicle and the vehicle of the at-fault driver. Lastly, take photographs of any skid marks or any other physical evidence on the roadway. Try to print out these documents from your cell phone on the date of the accident so that you do not lose these photographs or accidentally delete them. These photographs will help prove that the other driver was responsible for the accident. Further, the photographs will help document evidence that may be subject to loss or destruction at a later point in time. Provide your vehicle insurance information with the police officer. If the police officer does not arrive, then exchange such information with the at-fault driver. Be sure to ask the at-fault driver to see his/her insurance card so you can verify insurance and the date of effective insurance. Take down the policy number, name, address and car tag information of the other driver. Generally, you need this information to contact the at-fault insurance company and report your bodily injury and property damage claim. Often, the accident report will not be available for three to five days after the collision. By obtaining this information at the accident scene, you will be able to report your claim in a timely manner, while also obtaining vehicle repairs and a rental car. If you are physically able to safely drive your vehicle from the scene of the wreck after the collision, and you are experiencing pain or injury as a result of the accident, then please see a health care provider as soon as possible after the collision. If you can see such a provider on the day of the collision, then you will be able to have a medical doctor, chiropractor or other provider document your complaints of injury and pain and treatment for use in your bodily injury claim. Such documentation without a treatment gap or delay will help to maximize your potential settlement. Following these five steps will help ensure a smoother experience which is crucial during a stressful incident such as a motor vehicle collision. The sequential order of the steps is designed for you to follow the steps in a linear fashion and in matter of importance to your safety and the successful outcome in your bodily injury claim. The Law Offices of Kevin C. Ford is currently accepting car accident and collision cases throughout Georgia. If you or a loved one has been injured as the result of the negligence of a motorist, then please contact an experienced auto injury attorney for a free consultation.